The emphasis on developing the whole body through regular exercise and training make karate an excellent means of promoting good general health and fitness. The application of the self-defence techniques builds confidence and promotes personal security. 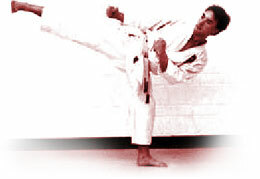 Highly dynamic, karate makes balanced use of the various body muscles, provides excellent all-around exercise and develops coordination and agility. Further benefits include improved self-discipline, strength and flexibility. Karate training helps students develop practical self-defence skills in a controlled atmosphere, and is an excellent way to relieve stress. Karate, like most martial arts, is 90 per cent mental and 10 per cent physical.